Jo Radkewicz, left, and Shakira Bone. CHORISTER and history enthusiast Joanne Radkewicz has been named the Derwent Valley Council's Citizen of the Year for 2016. 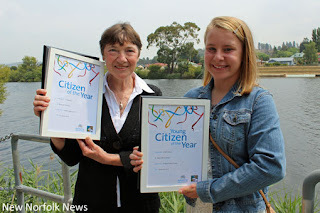 The award was announced on Tuesday by mayor Martyn Evans at the local Australia Day celebration at the Derwent Esplanade. Jo has been an active volunteer with the New Norfolk Historical Information Centre for some years. Most notably she has established management systems for the collection and storage of valuable artefacts. Jo also serves as the co-ordinator and facilitator of the Derwent Valley Community Choir. This group supports and performs at many community events throughout the year, including Australia Day, Anzac Day and the annual carols service at St Matthew's Church. 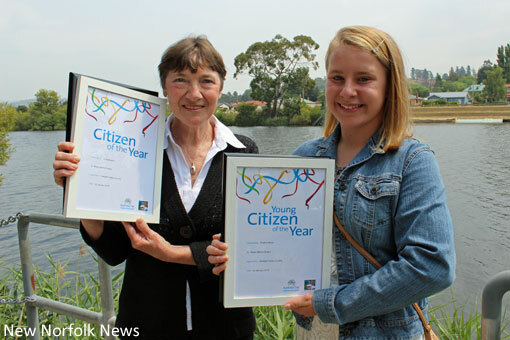 The title of Young Citizen of the Year went to Shakira Bone, 12, who has been an active participant in Corumbene Nursing Home’s "My Journey Program", which sees students visiting Corumbene on a regular basis to interview residents about their life and share their stories. Shakira is also a volunteer at the Tasmanian Dogs Home.